In Creating on Purpose, we finally have the more subtle principles underlying the laws of manifestation, and the profound use of the chakra system in implementing them. 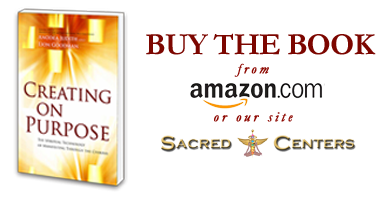 This book offers readers direct access to the inner spiritual resources of the creative process. Your chakras hold the energetic patterning that shapes your choices. Creating on Purpose provides a concrete, step-by-step program for utilizing these energies to manifest your highest possibilities. Creating on Purpose is a brilliant piece of work by two brilliant teachers. Their clarity and insight will open your life up to a new level of freedom and flow. Buy, read, and immerse yourself in this book, and your life will soar! An indispensable road map for ‘having it all’ through authenticity, love, integrity, and social responsibility! ~ Dr. David Gruder, Clinical psychologist, Author of The New I.Q. “We can only see what our eyes tell us. In the 21st century, our vision is all too often narrow and blurred. The reality we live in seems restricted, dark, and limited. But if we could open our eyes to the reality of the abundance which is already there, everything would change for the better. Creating on Purpose is about that transformation — the possibility of an unlimited perspective on our own being and the world we inhabit. An extraordinarily wise exploration of the natural flow of bringing any idea or project into reality – a practical guidebook on how to manifest your dreams. The chakras are a model for this process, scaffolding upon which life’s lessons can be built. I highly recommend it for anyone who has big dreams but struggles to ground them into daily life, and also for coaches and mentors who could use a powerful underlying infrastructure to guide their work with clients. Anodea and Lion, two distinct masters, have merged the best current psycho-tech and ancient wisdom together. I loved their synthesis. The accessible metaphysics, the engaging language, and inspiring stories make this a pleasurable and deeply useful guide to making your dreams real, one step at a time. ~ Bill Kauth, Co-founder of The ManKind Project, author of Circle of Men and We Need Each Other. Anodea Judith and Lion Goodman have taught this workshop to rave reviews in Europe, Canada, Central America, and across the United States. Exceptionally dedicated teachers, top notch quality material, integrates spirituality and practical day-to-day manifestation of dreams; both big picture and detail oriented.